Our winemaker hand-selects the highest quality grapes from different vineyard blocks and clones as the foundation for this complex wine with dark berry notes, firm tannins, and a long velvety finish. Viticulture notes. We balance the vine and position the fruit by hand to ensure proper ripening of these three red Bordeaux grapes. We hand-pick them very late in the growing season to maximize ripeness and tannin development. Fermentation. After primary fermentation (yeast), each component wine undergoes malolactic fermentation in stainless tanks and is racked into barrels. Vintage. NV. Our winemaker can select the best from among different vintages of the component wines to optimize the harmony and complexity of the blend. Aging. 12-14 months in a variety of oak barrels to add nuance and complexity. Winemaking notes. Harvested grapes for this wine are pressed into one-ton fermentation tanks. The juices ferment on the skins and caps are punched down twice daily. They are then racked and placed into barrels. Each component wine in the blend is fermented and aged separately. From a series of options, a blend is selected that maximizes the nuances of each grape while maintaining harmony. The chosen blend is then racked back into barrels where it ages for up to several more months. At com for direct shipment to residences and workplaces in 39 states. Aging. Store at cool temperature (55º-60ºF) and out of direct sunlight. Meritage can age gracefully in bottle for another 3-5 years, depending on the year. Serving. At cool room temperature (60-65ºF). Tasting notes. 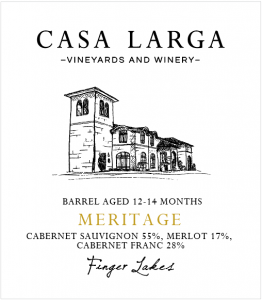 Dark berry notes, rich oak, a hint of pepper and a velvety palate make this limited edition wine among the most prized at Casa Larga. Pairing suggestions. Beef and lamb dishes with rich sauces like hollandaise, béarnaise, bourguignon, poivrade or stroganoff; goat cheeses and Manchego.